Upul Tharanga and Kusal Mendis struck half centuries as Sri Lanka beat Zimbabwe by six wickets to clinch the triangular series trophy at Queens Sports Club in Bulawayo on Sunday (November 27). After bowling Zimbabwe out for 160 in 36.3 overs, Sri Lanka lost three early wickets before Tharanga and Mendis chased down the target in 37.3 overs. Zimbabwe had shown great resilience in making the final after initial losses by going past West Indies, but in the title clash, Sri Lanka proved to be too good. Zimbabwe was rocked early after Graeme Cremer, the captain, won the toss and elected to bat first. Peter Moor, the wicketkeeper-batsman, was the first one to take a walk back to pavilion after being dismissed by Suranga Lakmal, the right arm pacer. Hamilton Masakadza, the other opening batsman, too couldn’t last long and was trapped in front by Nuwan Kulasekara. Though Tarisai Musakanda (36 off 37) and Craig Ervine (25 from 33 balls) did try to put the home side back on track, but the innings lost momentum after their 53-run stand for the third wicket. 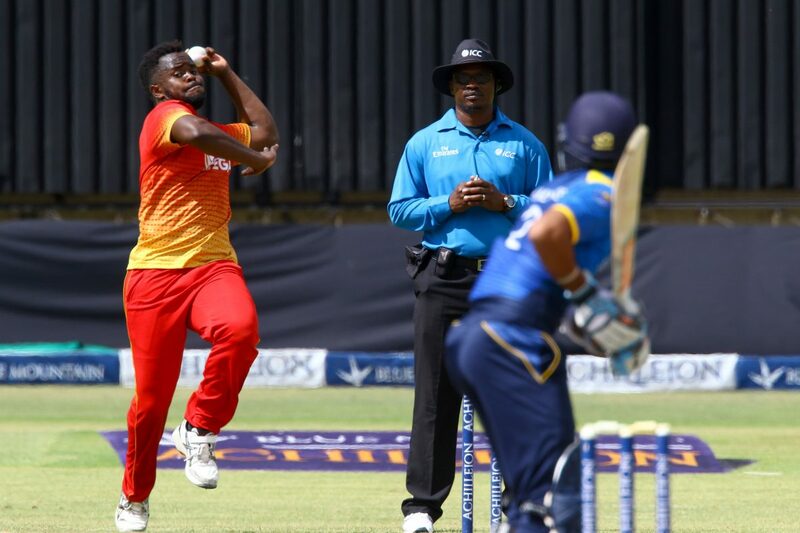 Musakanda was aggressive in his approach, hitting three fours and a six, but just when Zimbabwe seemed to have stabilised things, Jeffrey Vandersay, the legspinner, struck in consecutive overs to get rid of both set batsmen. Zimbabwe could not recover from those strikes and lost wickets regularly after that, going from 72 for 2 to 89 for 5. The only one to show some resistance in the second half was Sean Williams, who made a 54-ball 35 before he was eighth out in the 35th over, falling to Asela Gunaratne. Vandersay (3 for 50) and Gunaratne (3 for 10) did most of the damage in the second half, bagging three wickets apiece. Sachith Pathirana, the left-arm spinner, ended up with 2 for 26. Zimbabwe’s bowlers ensured that the home team would put up a fight, reducing Sri Lanka to 42 for 3, with Brian Vitori taking all three scalps with his left-arm seamers. But Mendis (57 off 72) and Tharanga (57 not out off 98) steadied things with a 75-run stand that took Sri Lanka within sighting distance of the total. Though Mendis fell to Cremer with 44 still needed, Tharanga played a captain’s knock, staying till the end to see his side across the line.